Crashpad is an open-source library initially developed by Google as a successor to the Google Breakpad library. It is used in popular software such as Google Chrome, and by companies such as Slack and Spotify. For existing users of Crashpad, Backtrace has plug-and-play support. It has a robust architecture designed to allow for a high degree of customizability and stability even in the face of most obscure of software crashes. For new users, Backtrace has prepared an enhanced fork of Crashpad, allowing easier integration with the service. 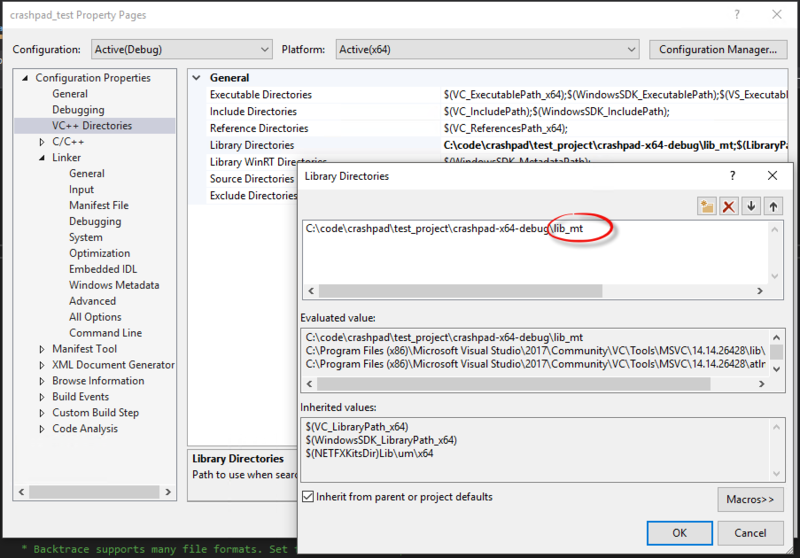 If you are Windows and Visual Studio, look ahead to the Visual Studio section to for a step-by-step guide to integrating into Visual Studio. Advanced instructions are available at the Crashpad home page if you can't find what you're looking for or prefer to build Crashpad from source. Backtrace's fork of Crashpad is available on Github. If you would like additional assistance, please don't hesitate to contact support@backtrace.io. Once Crashpad has been integrated into your application, you'll need to specify the right options to crashpad::CrashpadClient::StartHandler. For more advanced information on StartHandler, please refer to the documentation linked here. It's very similar to StartHandler, with the exception of the file_attachments parameter. file_attachments is a map of attachment name ⟶ path, allowing convenient inclusion of file attachments (i.e. the log file) with the crash dump. Change the url parameter to StartHandler or StartHandlerForBacktrace to point to your server dump submission port (labeled as http/writer in the listener configuration pane). Preferrably, the SSL enabled port should be used. If Backtrace is hosting your instance, the default port is 6098. For example, if Backtrace is hosting your instance at team.sp.backtrace.io, then set the URL argument to https://team.sp.backtrace.io:6098/. The URL needs to have a proper canonical form (the trailing slash shall not be omitted). The reason for this is the WinHttpCrackUrl function used by the Windows Crashpad uploader internally - it fails to parse the URL without the trailing slash. Two annotations are required to submit faults into Backtrace. Set format to "minidump". Backtrace supports a myriad of dump formats. 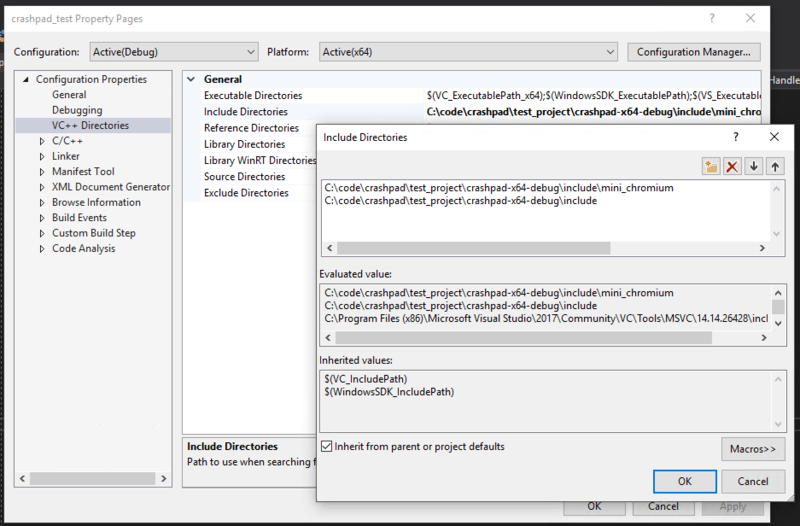 In order to have Backtrace recognize the incoming object as a minidump, the format annotation must be set. The annotations map can also be used to set additional attributes. Attributes allow you to embed relevant context into each crash report and can be any data point of your choosing. Examples include version, directx.version, graphics.card, etc. More information on attributes can be found in the product guide. handler is a path to an external program responsible for generating and uploading dumps. This is the recommended for uploading crashes. On Windows, look for bin/crashpad_handler.exe, which is suitable as a default crash handler. See below for a complete example. handler is executed once the application crashes, so it should be available under the specified path during its execution. That means that the handler should be bundled with the application if it's delivered to the end-users, and that its path should be relative or dynamically generated. See below for self-contained example code. The following code is also applicable to macOS applications, just ensure the various file paths are valid. * ENSURE THIS VALUE IS CORRECT. * handlers. This path may be relative. * YOU MUST CHANGE THIS VALUE. * Set this to the submission token under the project page. * THE FOLLOWING ANNOTATIONS MUST BE SET. * so it knows how to process the incoming dump. * REMOVE THIS FOR ACTUAL BUILD. * We disable crashpad rate limiting for this example. You can build Crashpad from source or download Backtrace-provided versions of the library. It is always possible to build Crashpad from source. In order to do this, please see the build guide on the Crashpad website. Backtrace's branch is available here. Backtrace provides updated builds of Crashpad. It is recommended to use the stable version. Nightly builds are provided if you want to take advantage of the latest improvements in Crashpad. The latest release of Crashpad is available at http://get.backtrace.io/crashpad/builds/. Once you have built Crashpad or download the pre-built libraries, you will now need to integrate the library into your application. The library is statically linked into your project, so you will not need to distribute any additional projects. There are two versions of Crashpad provided in the Backtrace archive. lib_mt contains the crashpad libraries built with the /MT switch for static linking. lib_md contains the crashpad libraries built with the /MD swtich for dynamic linking. Use the appropriate version for your application. 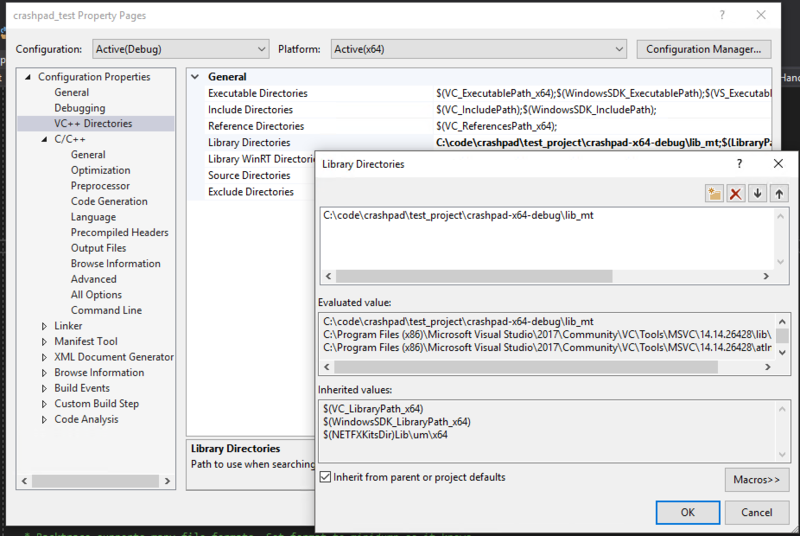 This section outlines how to import the Crashpad library into your Visual Studio project. First, you'll need to add the Crashpad directory in the include path for your application. The header files for Crashpad in the provided .zip file are in the include directory. Go to the project configuration menu (Project > Properties > VC++ Directories) and set Include Directories to point to the include and include\mini_chromium folders of the extracted archive. Now, you'll need to add the relevant release path (see the table above) to your Library Directories(Project > Properties > VC++ Directories). For example, if I am deploying a 64-bit Windows application, then after downloading the appropriate crashpad build, the lib_mt sub-directory is added to Library Directories. Once that is done, you'll need to add the actual set of static libraries for Crashpad. Navigate to your linker input settings (Project > Properties > Linker > Input), and add client.lib;util.lib;base.lib as an additional dependencies. See the screenshot below for an example. Remember to use the build of the Crashpad library that corresponds with your build configuration. For example, if you are building a 32-bit Debug build, then ensure that you are referencing the .lib files from the 32-bit debug build. If you encounter errors involving ITERATOR_DEBUG_LEVEL, then there is likely a mismatch between your build configuration and the build of Crashpad. 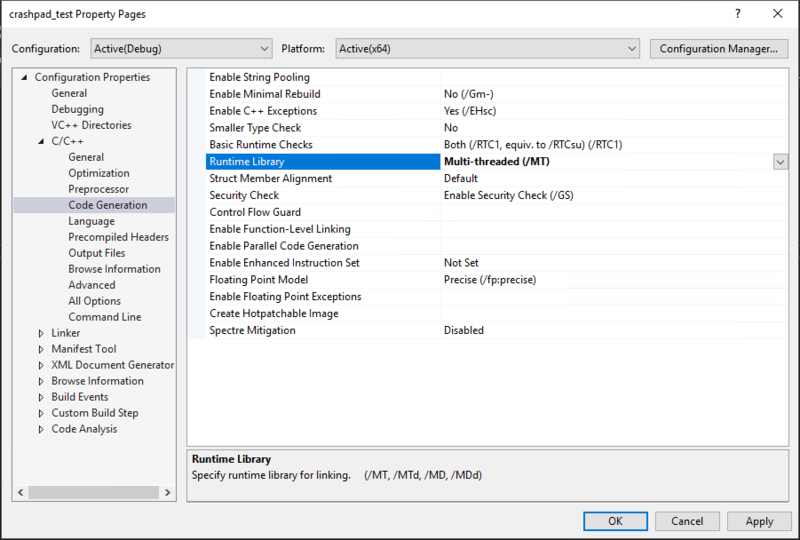 In order to change the build settings, go to Build > Configuration Manager then change your Active solution configuration. If you are using dynamic linking (the \MD flag), then make sure to use the lib_md sub-directory rather than lib_mt. For example, crashpad\lib_md rather than crashpad\lib_mt. Last but not least, ensure that you have code generation runtime settings set to a mode compatible with static libraries, such as Multi-threaded (/MT). 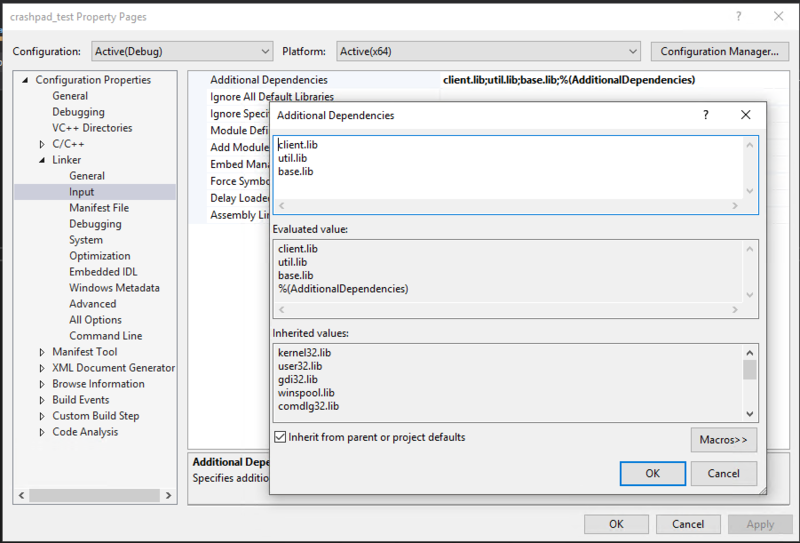 Go to Project > Properties > C/C++ > Code Generation and update the Runtime Library setting. If you are using dynamic linking, then ensure that you use the /MD option instead of /MT. It is required to upload symbols into Backtrace for intelligent deduplication and classification. 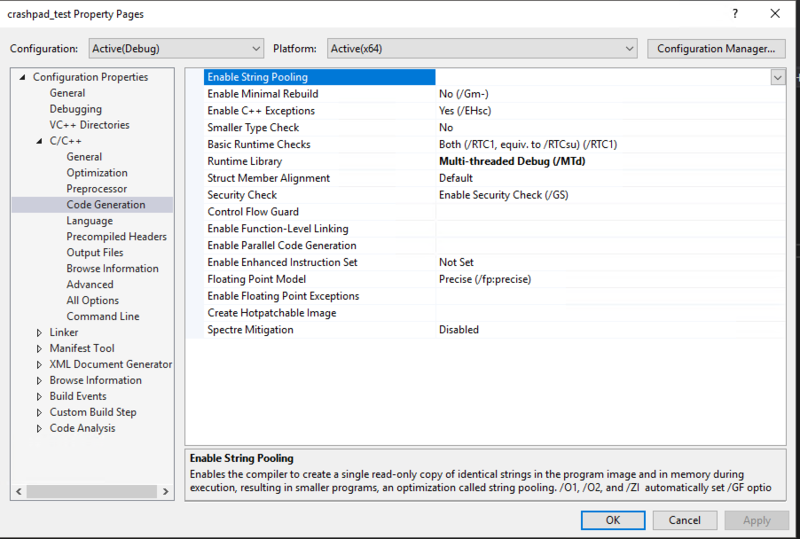 This section explains how to enable debug symbols for your application. Go to Project > Properties > Linker and update the Generate Debug Info setting. You'll want to set it to either Generate Debug Information (/DEBUG) or Generate Debug Information optimized for sharing and publishing (/DEBUG:FULL). The /DEBUG option is recommended if you would like to avoid the possibility of a performance impact. 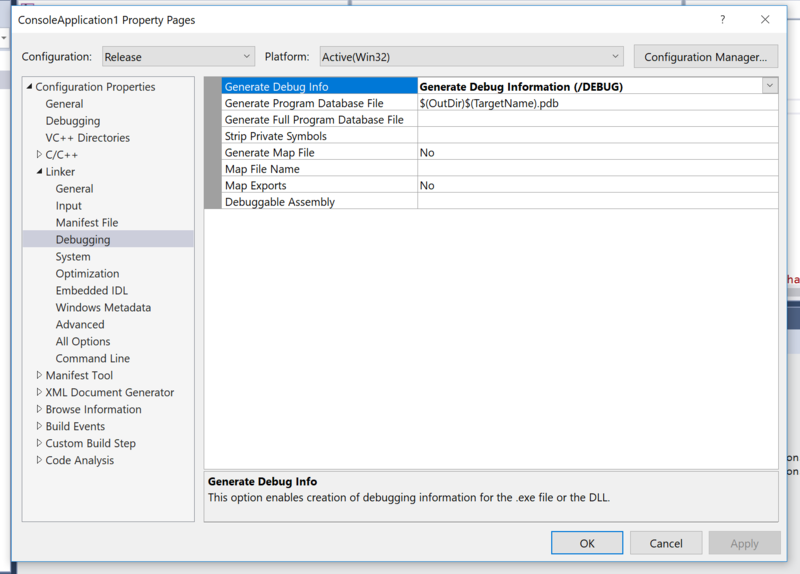 With this setting, a .pdb file will be generated for your application in the build output directory. You are able to upload .sym, .pdb and archive files containing .pdb or .symfiles into Backtrace manually or through the command line. It is also possible to hook up Visual Studio to automatically upload symbols as they are generated. You should be good to send crash reports at this point. Simply ensure that you've uploaded your symbols (click on Symbols tab under the Project Configuration page). For more details, please refer to the symbolification guide. Congratulations, now you're ready to integrate Crashpad into your application. In order to do this, you'll need to add the code from the section Example code above. For Windows applications, consider using the convenience function StartHandlerForBacktrace. At this point, crashes should be automatically submitted into Backtrace. As crashes generate, refresh the Project page of the associated project to see faults in real-time. The fork provided by Backtrace additionally offers file upload support for Windows applications. To make use of it, use Backtrace-specific function StartHandlerForBacktrace, as discussed above. the process must end (the exception may be handled). The default Crashpad crash handler binary uses WinHttp to upload crashes. On those systems, TLS 1.1 and TLS 1.2 are in the default protocol set, and only TLS 1.0, and SSL 3.0 are available by default, which are not accepted by Backtrace. This should be fixed by KB 3140245, but you may want to add them to the default list manually via the registry. We suggest doing it in your application installer. Additional documentation is available at the Crashpad Website. For more information on the crashpad_handler, please see crashpad_handler.md. If you're still encountering issues, contact us at support@backtrace.io.